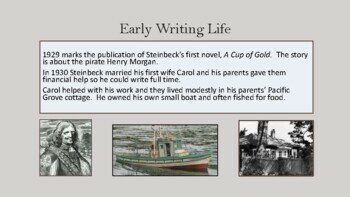 Use this 24 slide presentation to introduce John Steinbeck's life and work to your classes. 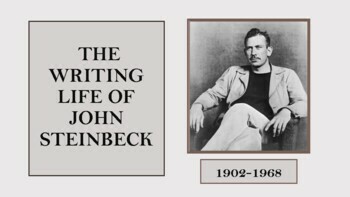 The set includes notes on his life, major works, beliefs, and achievements. Photographs and maps help students visualize the author along with the places he lived and worked. 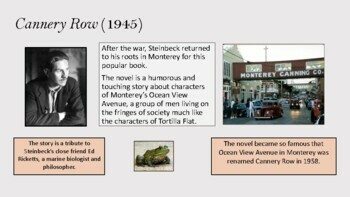 Also highlighted are Steinbeck's social and political interactions during the Depression and W.W. II with explanation of how these historical events shaped his writing life. This file is also included in The Grapes of Wrath folder of activities.